Is it Sunday yet? Only 4 more days until one of best shows on television comes to an end. It’s Breaking Bad week on Yes Totally, so celebrate with us and throw a series finale viewing party for your friends. 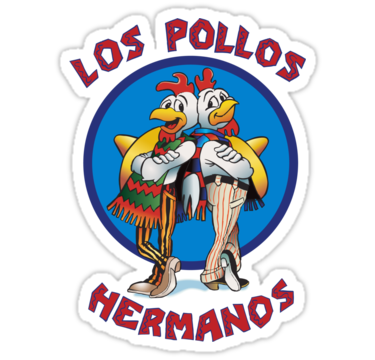 Los Pollos Hermanos Fried Chicken – No viewing party would be complete without some of Albuquerque’s favorite fried chicken. There’s got to be something in that batter that makes it so addictive! We know from the commercial that this chicken is seasoned with only the freshest herbs and spices. Try this Serious Eats recipe for Spice-Rubbed Southern Fried Chicken. The combination of smoky paprika, heat from the chiles and sweetness from the brown sugar makes this spice rub sound like a winner. The recipe calls for skinless chicken, but we say go for the skin-on chicken if you want it to be extra-crisp and tasty. Of course, you can always buy a bucket of your favorite local fried chicken and slap a Los Pollos Hermanos logo on it for effect. Better Than Albertsons Green Beans – Poor innocent green beans make an appearance in one of the most awkward dinner scenes of all time. In an attempt to compliment Skyler’s cooking, Jesse inadvertently compliments the Albertsons deli. No disrespect to the fine folks at Albertsons, but we think we can make a better green bean dish. Try this simple recipe for Green Bean Almondine from Saveur. I usually finish off this side dish with a squeeze of lemon to brighten the flavor, or you could also use a fancy finishing oil like walnut or hazelnut if you have it. Rooftop Pepperoni Pizza – This is another easy dish to put together that can be as simple or fancy as you want it to be. Pickup your favorite pepperoni pizza from somewhere and serve it up; bonus points if it’s ridiculously large. Or make your own pizza, using thin slices of pepperoni, lardo or salami. Check out Mario Batali’s recipe here. Flynn’s Churro Pancakes – I had to get some kind of breakfast thing in here since Walt Jr. is the Breakfast King. I found this recipe for Churro Pancakes and thought that they could serve as a kind of Tex Mex-ish dessert. Instead of making large flapjacks, I would make them small like silver dollar pancake sized. Smothered with butter and cinnamon sugar, they’ll provide a small sweet bite to munch on. Or try this recipe for Sour Cream Cinnamon Roll Pancakes. Again, make them small and cute so your guests aren’t overwhelmed. Of course, we couldn’t leave this last one out. If you make nothing else, make the effort to try this recipe since your guests will get a huge kick out of it. Walt and Jesse’s distinctively blue product is called ‘Blue Sky’. On set, the ‘glass’ is really blue-colored rock candy, broken and bagged. Best of all, you don’t need an RV or lab equipment to cook up this sweet batch. Package up the stuff in some small plastic baggies and pass out to your friends who want a (sugar) high. 1.) Line a half-sheet pan with foil, and spray the foil with nonstick cooking spray. 2.) In a medium saucepan, combine the water, corn syrup, and granulated sugar. Place the pan over medium-high heat, and stir until the sugar dissolves. Bring the mixture to a boil, then stop stirring and brush down the sides with a wet pastry brush to prevent sugar crystals from forming. Insert a candy thermometer. 3.) Continue to cook the candy without stirring until it reads 285°F on the thermometer. Do not overcook it, or it will start to take on a caramel color and your candy might turn green. Once at 285°F, take the pan off the heat and let it sit for a few moments, until bubbles stop breaking on the surface. Add the flavoring and food coloring, and stir everything together. 4.) Pour the candy onto the prepared baking sheet; tilt the sheet pan so it becomes an even, thin layer. Let it set up at room temperature. Once it’s set, break it into small pieces with a mallet. Divvy it up into plastic baggies or an airtight container of your choice.